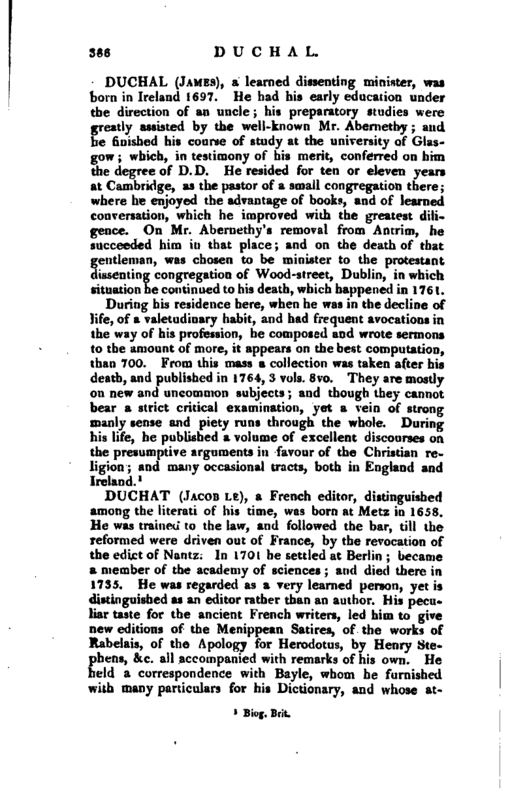 , a learned dissenting minister, was born in Ireland 1697. He had his early education under the direction of an uncle his preparatory studies were greatly assisted by the well-known Mr. Abernethy and he finished his course of study at the universitv or Glasgow which, in- testimony of his merit, conferred en him the degree of D.D. He resided for ten or eleven years at Cambridge, as the pastor of a small congregation there; where he enjoyed the advantage of books, and of learned conversation, which he improved with the greatest diligence. On Mr. Abernethy’s removal from Antrim, he succeeded him in that place; and on the death of that gentleman, was chosen to be minister to the protestant dissenting congregation of Wood-street, Dublin, in which situation he continued to his death, which happened in 1761.